Last year I tried my best to keep up with a weekly catch up and mostly I did (although I started it late into the year) I'm finding it difficult to write the weekly catch up, so I'm now going to blog a monthly catch up post which will be really easy to do. I'll get to look at all the bits of the month and not just the really good bits so it will be different from my 10 reasons to smile posts! We all started the month bunged up which wasn't a fantastic start! I saw the new year in in bed while Mr B went out for a bit and the children were snoring (and sniffing) but I was quite happy. I was mostly preoccupied with Midge's upcoming birthday at the start of the month, it had to be good obviously. In the end the day came and her party was a lovely, small gathering of cousins and friends. 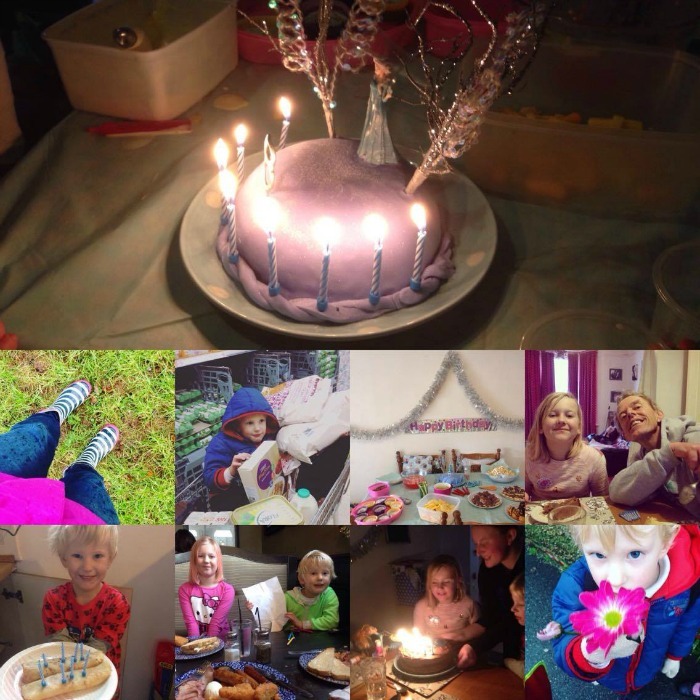 There were sweet things, frozen cakes and a family roast dinner on her actual birthday. I made several trips to Weatherspoons last month (which explains why I'm so skint at the end now I suppose!) I surprised the children with after school dinner and the second trip was Mr B's birthday dinner. That was a lovely way to end a busy day in Plymouth. 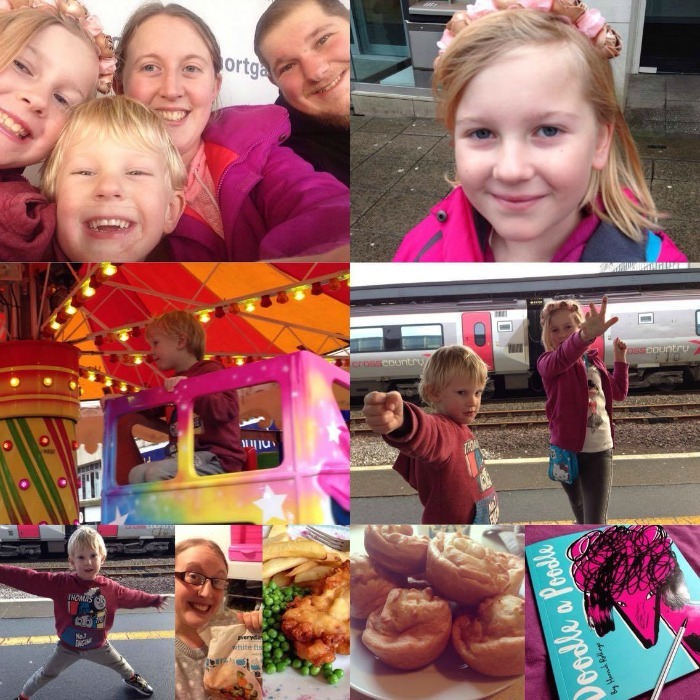 We got up to lots in Plymouth, looking around, shopping, enjoying several train journeys it was all such good fun and well overdue. There were lots of wet school runs, my wellies have worked hard and have already sustained a cut so now I'm getting soggy socks every time I go out! There are some signs of Spring popping up though which of course makes me happy. Little A had a trip to the aquarium with his class and Midge brought home a trumpet from school...say no more! I've looked into some courses but am keeping things close because I'm very nervous and have a few questions to ask myself first! I booked a new GP appointment to discuss my anxiety medication and I'm going to force myself to mention my chronic blushing and see if there's any help out there. I also got busy comping and it paid off winning a £50 supermarket voucher, £50 lingerie voucher, a set of pretty goodies and 2 Muggle Tour tickets. I lost the hearing in my right ear for 2 weeks which was horrid and I'm pleased it's back! I've also watched a lot of Four in a Bed! I reviewed Hippy Paste deodorant and now I smell fabulously minty but you can smell of lavender, citrus or even ylang ylang! I wrote about my beautiful daughter's 8th birthday and 10 Reasons to Smile which is always a lovely post to write up. I shared some early January bargains and freebies (I'll be blogging a round up of the latest prizes, bargains and freebies very soon!) Lastly, I shared an open post about a particularly hard day (week). I hope you enjoy looking back through these posts if you haven't had a chance to yet. I didn't know you lost your hearing for two weeks, how'd that happen?! I hope everything goes well with the GP, keep me updated! Sounds like you had a lovely month. I'm glad you are all feeling better and that your hearing has come back!